Replacing Galley Works, our new Chef Tales feature will document the adventures of Canadian Chef Andrew Siebert. He’s an executive chef aboard the Carolina, a private yacht currently navigating the Atlantic Coast of the United States. We’ll follow along as he tells us of his travels, creating and sharing recipes along the way. His years of boating and cooking experience translate into a practical source of advice on everything from travelling, food preparation, provisioning, cooking in a galley, entertaining guests on a boat to planning for long trips aboard. Growing up, I always had an appetite for cooking and fine cuisine. Acting on my passion, I trained to be a chef in Vancouver. Over the past ten years I’ve been travelling around the world working on yachts, cooking for the rich and famous. Catering to the elite means I begin my day at 4:30 am. I rise early to ensure that bread, pastries and sauces are made fresh daily. From there, I prepare breakfast, lunch and dinner for the guests and 11 crew members who call the Carolina home. I’m responsible for planning and cooking all meals and making sure there are enough provisions to last while the ship is at sea until it makes berth again. 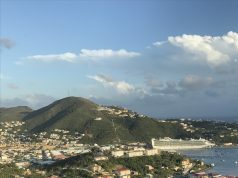 Living and cooking aboard a ship is certainly a unique lifestyle and I’ve been given the opportunity to share with you some of my yachting adventures and the recipes that have been inspired by them. 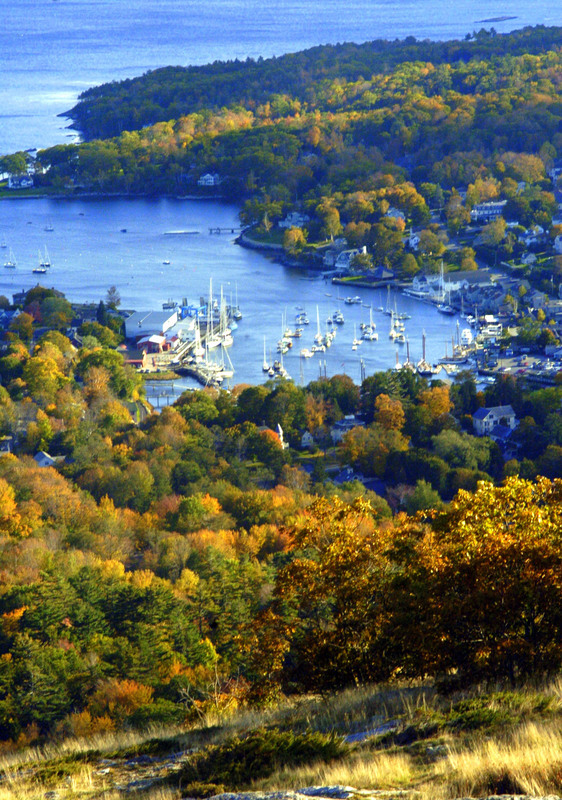 As I write this, we are currently cruising up the east coast of the United States, in and around the waters of Maine. 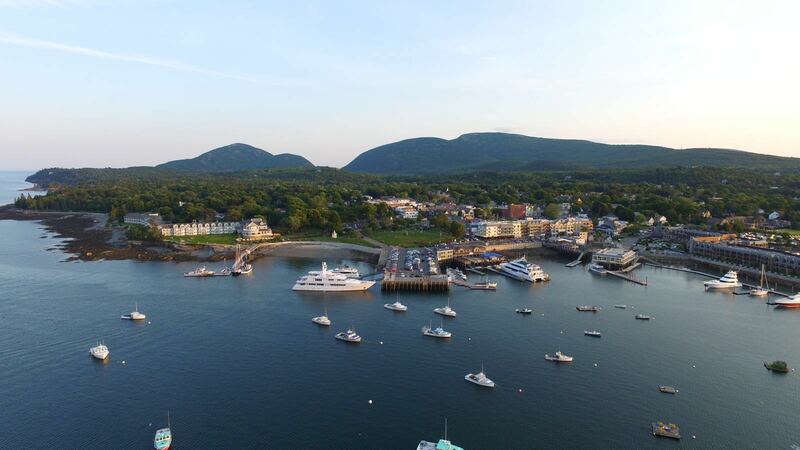 The picturesque shoreline, heritage lighthouses and, of course, lobster are some of the popular attractions that draw 30-million people to the state annually. Lobster is plentiful at this time of year and though the Maine variety is by far the most succulent, and of the highest quality, my patriotism leads me to believe they all migrate down from Nova Scotia. As we venture through the areas of Portland, Rockport, Camden, and Bar Harbor, I have the rare fortune of being able to stop to chat with local fishermen. Nothing beats using fresh ingredients. Getting my hands on some of Maine’s finest lobster, right from the ocean trap, is about as fresh as you can get. Fresh lobster ready to be prepared. 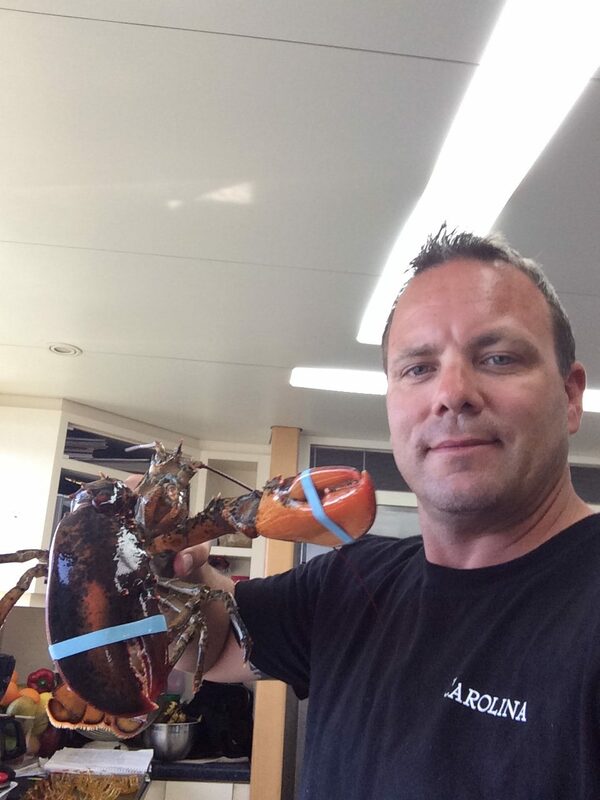 Chef Andrew Siebert holds a fresh Maine lobster about to be prepared in the galley of the Carolina. 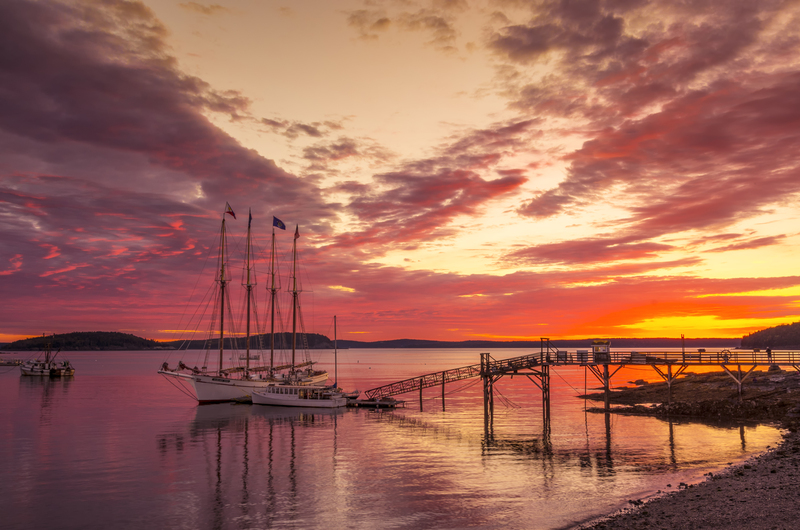 The Carolina at Bar Harbor. 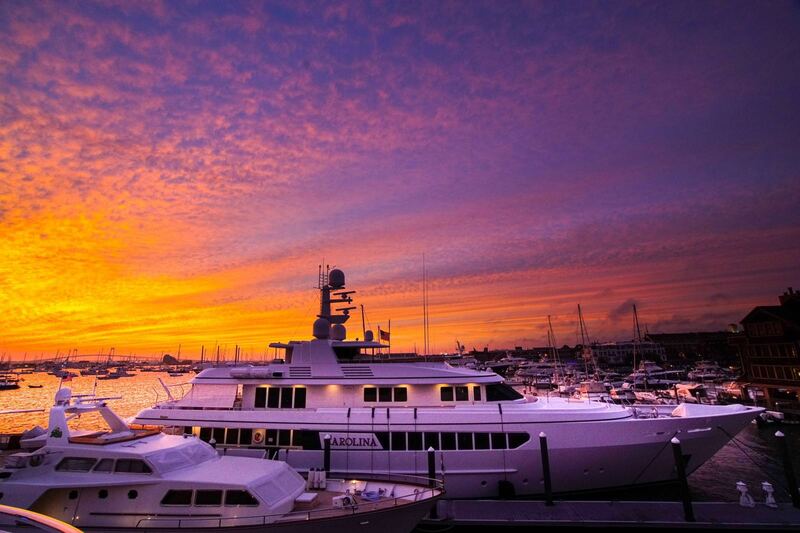 The Carolina docked at sunset. Encouraged by our visit to Maine, I’ve prepared a simple recipe featuring the delectable crustacean. Make this Butter Poached Lobster and Avocado Salad with Lemon Aioli for your friends and family and they’ll be sure to believe you’re a top-notch chef! Makes one serving. Adjust accordingly. In a medium size pot, add four cups of water, a tablespoon of salt and two pounds of butter. Bring to a simmer. Pierce the lobster shell with toothpicks, placing them throughout the tail to hold the meat together and to ensure even cooking. Drop the lobster into the liquid and simmer for 5-7 minutes, depending on the size of the lobster. 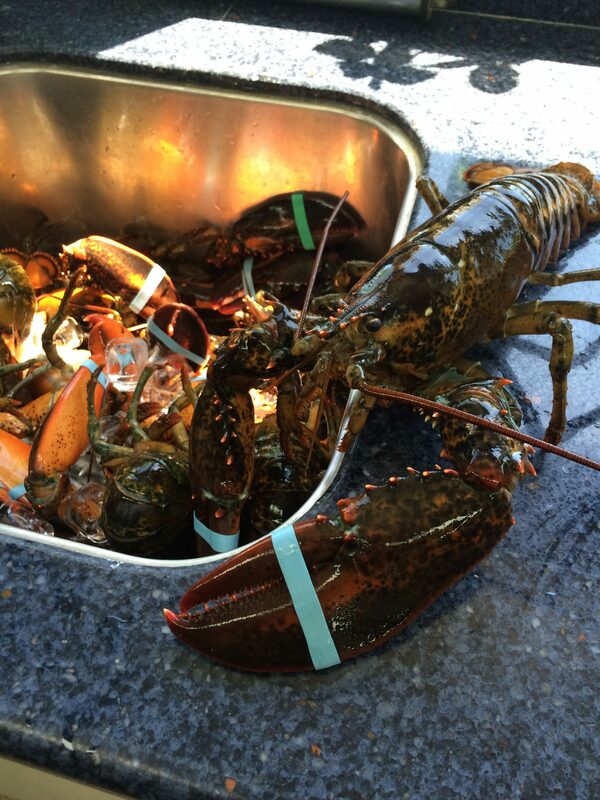 Remove lobster from pot and discard toothpicks. Roughly chop all meat into bite size chunks and place in a bowl. In a blender, add 2 cloves of chopped garlic (roasted is great). Squeeze in juice of 2 lemons with zest. Add egg and a splash of honey. While blending, slowly pour in 1 cup of olive oil. The mixture will emulsify (join together and become thick like salad dressing). If the mixture becomes too thick, add a little warm water to even it out. Season to taste with salt and pepper and fresh chopped herbs (e.g. parsley and chives). Mix aioli into lobster meat. 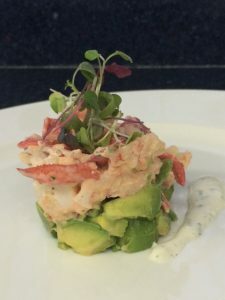 Chop avocado into bite size pieces and place on plate with warm lobster on top. Drizzle a little aioli over plate.